*Fully equipped Kitchen with side-by-side Fridge, Dishwasher, Large Range and built-in Microwave. 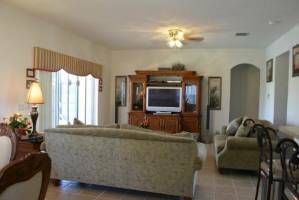 The position of our vacation home rental could not be better, just 10 minutes from all the Disney theme parks, 3 miles from Highway 192 and the heart of Kissimmee, with all the attractions it has to offer. You could not be better located. All in all, the perfect place for your Florida adventure!! We had a great time - thanks. Lovely home, very spacious for our 'gang'. thanks again. Thank you Tim and Caryn, we have had a fantastic holiday in your beautiful home. Thank you for all the extra comforts you have provided - the central heating was useful it's been freezing! Weather Great - Lovely villa, ample room, pool wonderful. Thank you for sharing your home with us. Apart from the flu, a good time was had from youngest 16 months to eldest 81 years of age. Thanks so much for your lovely, beautiful and super house! It felt like our hoe. The game room was great! and the pool was even better! we wee always entertaind, even when not in Disney. Thanks again. This was our kids first time in Florida and Disney. We had a great time. Your house is beautiful and the kids loved the pool. We settled right in, thanks soo much. I came with my daughter, son-in-law and 4 grandchildren. Your home is beautiful and hopefully I can do this again with my other children and grandchildren. I had a wonderful time. Thank you so much for allowing us the use of your home, we really enjoyed it. We came here to celebrate the occasion of Bert's retirement. After 4 nights at Disney, we had a fabulous time here "chilling" and enjoying each others company. Your home was the icing on our cake. We had a marvellous family holiday here, the weather slightly warmer than what we re used to!!!! The pool was certainly put to good use. Thank you again - you have a beautiful home and we really enjoyed our stay! Thank you so much again for letting us rent your beautiful home. My mother-in-law absolutely loved it too. We hope we'll have the opportunity to do it again. This was probably one of our last family vacations before our kids go off to college. Your home made our experience THE BEST time we have ever had on vacation. In fact we are now considering buying a villa ourselves. May god's richest blessings overtake you. Thank You!! Thanks for the use of a beautiful house. Our families had a great vacation. From the moment we walked in we know this was a beautiful home with beautiful family memories. We have just spent eight days in our lovely home. Thank you to all the above who left wonderful comments in our Visitors Book. We look forward to our next visit. We'll be back! Thanks so much, one of the best vacations.....EVER!!! !, nice house, great golf. Our family had a good trip, we enjoyed Disney and the Builders Show. Thanks for allowing us the use of your home. My family had a great vaction. We have great memories from your beautiful home, thanks. Tim and Caryn, THANKS for your hospitality, now we have great memories from "The Lady of The Lake". We'll be back! We are so appreciative of your wonderful house - it made the vacation a truly relaxing vacation! the decor is beautiful! Thanks for having the baby cot ready for us, hope you get lots of use from the Cappuchino machine. We had a fabulous time in Kissimmee and Disney! We enjoyed your beautiful home! It was great to come back, to relax and swim! We hope to come back soon. Thank You. My family and I had a wonderful time. Thank you for sharing your lovely home with us. Our trip was short but your home made us very comfortable. Thank you so much. We had a wonderful time in your lovely home. We were impressed with the decoration and the comfort. Now we return to PA and 10 inches of snow. May the Lord bless your family. We have decided that we must stay longer next time. Thank You! 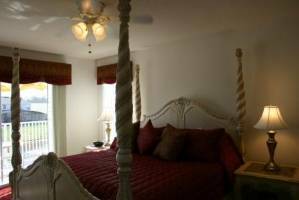 Our home sleeps 12(14 with sofabed) in 6 bedrooms: 2xMaster(1xKing,1xQueen),1xfurther Queen+3xTwins.5baths(3 en-suite)+poolbath & sofabed in Den. Large heated pool+spa,lake, view,gamesroom,PlasmaHDTV+TV/DVD/Video+full individual DirectTV in all bedrooms+den,PSX2+X-box,air-conditioning,alarm,balcony & luxury fittings throughout. Situated on a quiet gated community 10mins. from Disney. 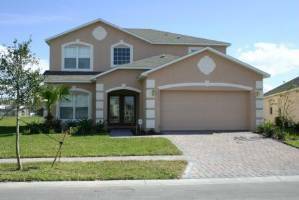 We fell in love with the Orlando area many years ago, after much searching we finally bought a wonderful 6bed/5.5bath vacation home in what we consider the best location at Cumbrian Lakes, Kissimmee, 10mins. from Disney & within easy reach of all major theme parks, shopping & restaurants. For brief details on our home please see the next comment. Minimum stay required is 3 nights (7 during Holiday Season) Our pricing is competitive and includes all local taxes, final clean and pool heat for the duration of your stay Our Security Deposit is $400, refunded within 4 weeks of departure - following satisfacotry report from our management company Extras include: BBQ Rental - Please email for details We offer a discount of 5% on stays of 2 weeks and over. Discounts are available for payment in full with booking and on late deals - contact us for a quotation. Deposit: Deposit of 20% required with booking, the balance payable 60 days prior to arrival.